"Carrots sweetened with honey and lemon, with a hint of ginger." These were just OK. The lemon taste was too strong for my liking, and I could hardly taste the ginger (I used 1/8 tsp). Might be better with less lemon juice and more ginger. Very easy and a nice flavor. I cook the carrots longer to get the flavors mingle. It takes even better the next day reheated! These were so delicious and easy! 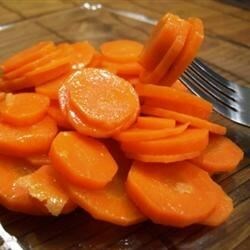 I steamed the carrots first, and then added them to a pan to warm the remaining ingredients. I also used about a 1/2 tsp. ginger.